With today’s busy lifestyles, we all need (and deserve!) some “me time” to destress, re-energise and treat our bodies. 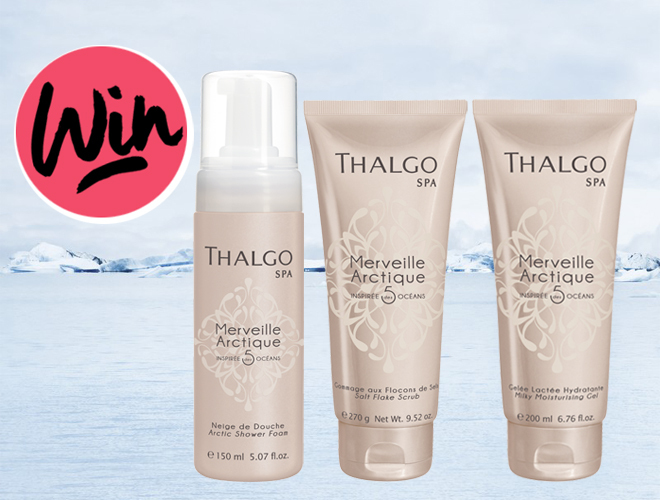 Thalgo La Beaute Marine knows just how to create a luxury spa experience in the comfort of your own home with the luxurious Merveille Arctique homecare range. This three-piece product line complements Thalgo La Beaute Marine’s exhilarating professional spa experiences, allowing you to bring the spa to your home. Arctic Shower Foam (R494.00) – White as snow, this luxurious foam offers a sensory shower experience, leaving the skin velvety soft and exquisitely fragrant. All skin, even fragile, is thoroughly cleansed, purified and soothed. Salt Flake Scrub (R821.00) – Rich in relaxing magnesium and combined with micro flakes of 3 exfoliating salts, this intensely sensory Merveille Arctique Scrub transforms the skin, leaving it wonderfully soft and velvety. Milky Moisturising Gel (R691.00) – This gel is a hydrating, film-forming, delicately pearlescent texture that envelops the body in a gentle veil for a silky, iridescent finish. Application of the Milky Moisturising Gel is a real sensory experience where the stimulating texture and effective marine active ingredients come together to relax, soothe and enhance the body. One lucky reader stands the chance to win all three Merveille Arctique products worth over R2000! All you have to do is complete and submit the form below. Good luck! This competition is open to SA residents only and closes at 21:00 on 28 February 2019. You may enter as many times as you wish if you would like to increase your chances of winning. The winners will be drawn from all the correct entrants and notified via email. This prize cannot be exchanged for cash. BeautySouthAfrica.com’s decision is final and no correspondence will be entered into. We will not share your information with any third parties. If winners do not respond to email notification within three days, another winner will be drawn. BeautySouthAfrica.com will supply all hampers to the delivery company in good order, but will not be held liable for the condition of hampers arriving at the winners’ chosen delivery address. Please allow six to eight weeks for delivery. If you have won a prize on BeautySouthAfrica.com in the last two months, you are ineligible to win this competition.